On her very first day as Executive Director last fall, Patricia Lozano met with Department of Finance staff to discuss Early Edge’s budget priorities, including that lawmakers make dual language learners (DLLs) a priority. That critical first conversation was the birth of the Licensed Child Care Teacher Professional Development Program. What the $5 Million in New DLL Professional Development Means for Early Childhood Educators. Read more. After eight swift but intensive months working in collaboration with key partners including Californians Together, the Advancement Project, PEACH, and the California Association for Bilingual Education (CABE), to secure $5 million in the State Budget to help licensed child development teachers develop effective strategies for DLLs in their care, our work has paid off! 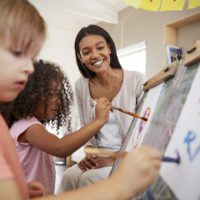 In addition to the $5 million for child care teachers, the State will be providing $25 million for TK-12 teachers to earn their credentials to teach California’s English learners. These investments, that follow last year’s investment in the TK-12 Bilingual Educator Professional Development Program, signal a promising new direction for California—one that values the State’s rich diversity and recognizes a child’s language as an asset to his or her learning. We applaud the State Legislature and the Governor for making this important shift. With respect to other ECE investments, at about midnight on Friday, the last of the details were approved by the Legislature’s Budget Conference Committee and ECE is poised to receive about $1 billion to fund a combination of infant and toddler slots, increase the infant and toddler provider rates, and improve the quality of birth-to-five programs, including the $5 million to support DLLs. These investments put California on a promising path to meet the needs of families and children. The Legislature must send the State Budget to the Governor by midnight on June 15th. The Governor has until midnight on June 30th to sign the Budget.